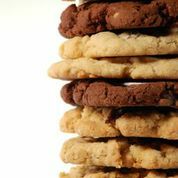 Our cookies are made in a bakery that processes milk, eggs, tree nuts, peanuts, wheat, and soybeans. Even though we strive to protect our products from cross contamination during mixing, baking, storing, and packaging, there is always the possibility of contamination. If you are allergic, we advise you not to eat our products.